David Willey's Transport blog: How about a North Glasgow circle? How about a North Glasgow circle? In 2005, Kelvindale railway station was opened in Glasgow, allowing diesel trains from Queen Street high level to travel to Anniesland via Maryhill to connect with electric services to Dalmuir from Queen Street low level. Now a look at the railway map shows an almost circular route from Anniesland to Ashfield (by diesel train) in one direction, and to Springburn (via Queen Street low level) in the other. The missing part of the circle is a non-passenger line at Cowlairs junction. To get from Ashfield to Springburn, one must travel into Queen Street and change trains. 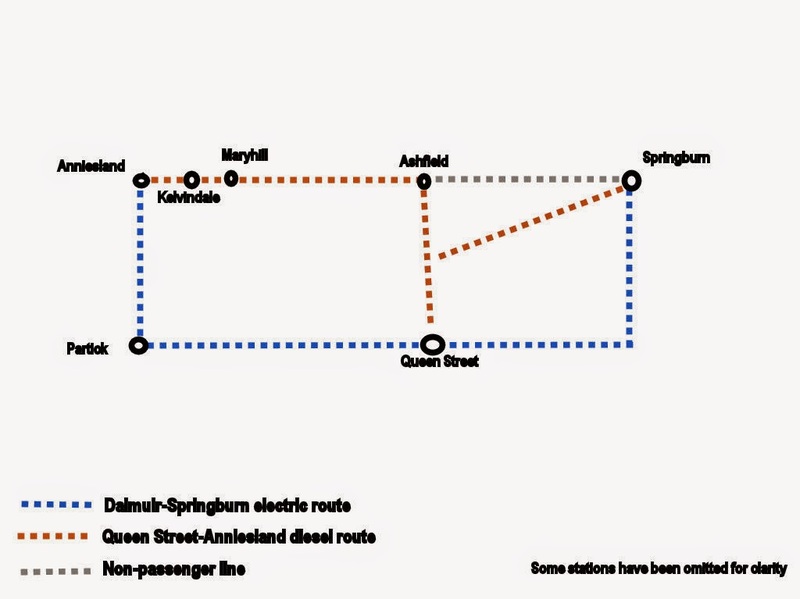 But what if the circle was completed/ If the line from Springburn to Anniesland (via Kelvindale) was electrified and the Kelvindale branch (which terminates in a bay platform at Anniesland) was joined to the electric line to Queen Street low level, you could than have an urban electric route that allows cross-city travel without changing trains and frees up platforms at Queen Street high level. Two reasons to build the Garngad chord.